Yay, it’s here! The list of my top thrifting finds from the past year. This list is not based on anything scientific, like reader favorites or highest value to price paid ratio (is that a thing?). Nope, it is purely the finds that me, myself and I liked the most. And ended up using the most. 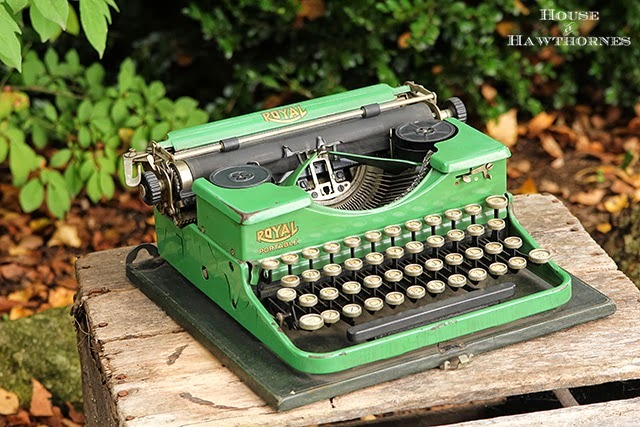 My very favorite item I found this year, hands down, is George, my 1937 green Royal typewriter. He turns my head every single time I pass by him! My Buddy L Zoo truck that I found at the Country Living Fair comes in a close second. 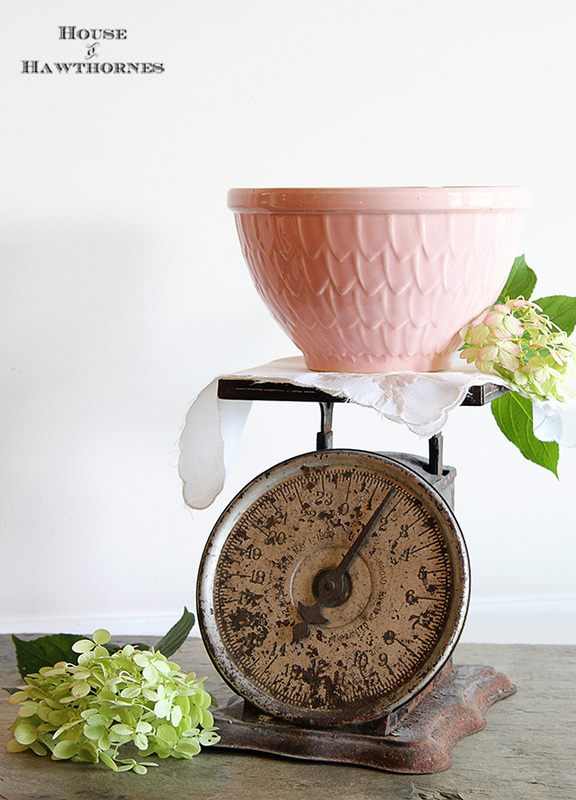 A little McCoy mixing bowl, in the prettiest shade of pink, is another favorite. And while we’re on a pink kick, this Boston pencil sharpener that I pried off the wall at an estate sale is pretty darn cool. 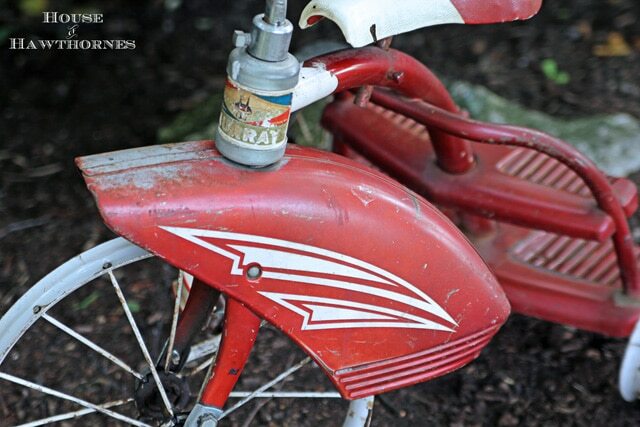 The vintage Murray tricycle named Trixie that I found at a barn sale is a classic. A pair of vintage porch planters plucked from a church rummage sale stayed on my porch all summer and well into fall. I didn’t want them to crack, so they are currently living in my garage to protect them. 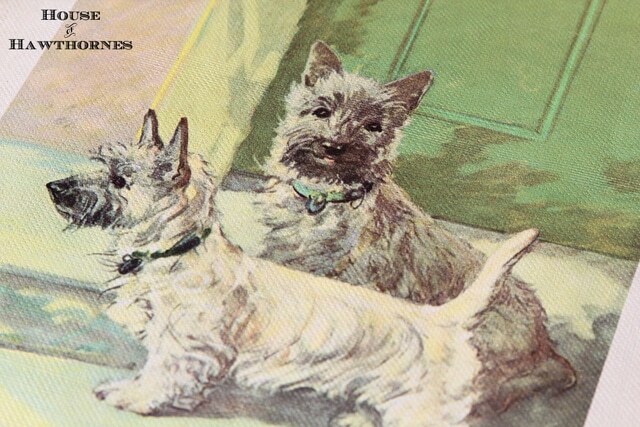 This 1937 Children’s book of dogs has the cutest dog images in it! I scanned images from it that you can download HERE. I was surprised to find this McCoy blue bird planter at a yard sale. I’ve eyed them at antique stores, so was happy to find one for a dollar. It’s deals like these that keep me on the prowl. 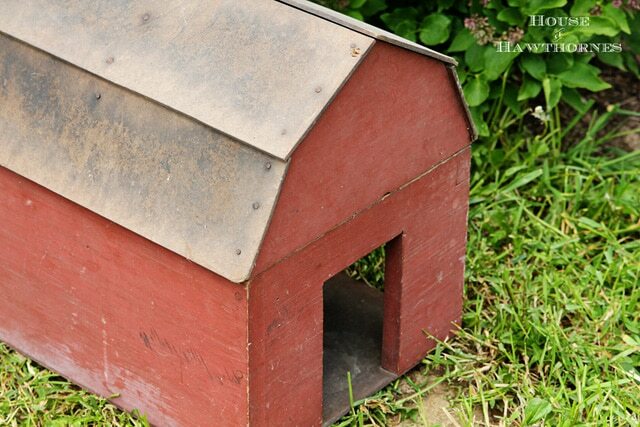 I found this wooden toy barn at an estate sale this summer and it’s been all over my house. For Christmas it served as a home for my nativity set. and my Kodak Duaflex III are two examples. 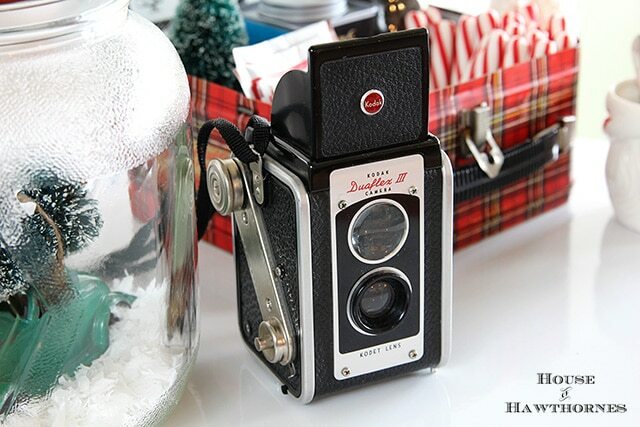 Well, hope you enjoyed my list of favorite thrifting finds for 2013. I hope to be able to get out and do more thrifting in the coming months. I’m sort of at the mercy of the thrift store Gods at this point in the year. Can’t wait for the snow to thaw and the yard sales to kick in. Those are some Fantastic Finds! Oh how I love finding secondhand gems for not much money at all! Great stuff, that typewriter is amazing. I’ve never seen one that color, gorgeous! Just don’t be surprised if one day your green typewriter is gone. I can travel all the way from Texas you know…just kidding! I do love your finds! what fun finds Pam!! 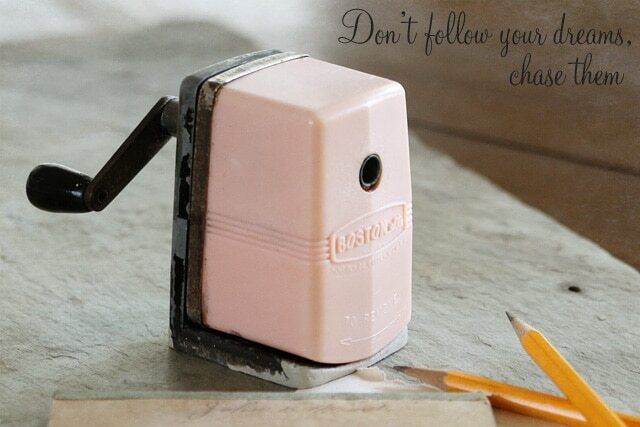 The pink pencil sharpener is my favorite!! I collect McCoy too and love it, OH, if they could only talk:) The typewriter is gorgeous! That typewriter would be number one on my list too! I remember when you found it. I’m not a collector or normally a lover of typewriters at all but if I found one in that color, it would definitely be coming home with me! I love all your finds. You have such talent at finding the best stuff. My fav’s of your fav’s is of course George, the red truck and the blue bird. That typewriter is at the top of my list too, fabulous! I think I need to shop where you shop. They are all great finds…I love all of them. The typewriter is fantastic. I dream with one similar to that, pink would be just perfect. LOVE them all but my favorite is the typewriter. Love the green typewriter, McCoy bird vase and those vintage dog images. What great finds! Best wishes for the New Year! and would love for you to come join the party! Oh, the thrill of the hunt is what I adore. Isn’t it exciting to never know what you might find? It is an addiction and I am such a junkie! Pam, I can tell we would have a lot of fun together, but unfortunately, our tastes are too similar and we would be reaching for the same things. I would hate to have to knock you down, LOL, Love all your finds. That bird is just up my alley, have a bowl in blue and a sharpener in red. Yep, we both have such good taste. Hang in there, winter is not only cold, but we have to wait for the yard sales. Lol. Actually I probably donate about as often as I buy from the thrift stores. It’s just a revolving door of 90’s decor traded in for more vintage looking stuff 🙂 I use most of the stuff to decorate with though. Pam, I get teary every time I see your green typewriter–my grandmother had the same one on her desk, where she typed up the Badger Amateur Baseball Stats to several WI newspapers. I always dreamed of inheriting it, but before I knew it, it had been dragged to the dump along with all the Dresden Christmas ornaments. Makes me queasy just thinking about it. I am considering moving to OH just for a chance at the awesome vintage goodies available!! IL has nothing like your marvelous finds! Definitely awesome finds! That green typewriter is absolutely awesome. I’ve never ever seen anything like that style. I can’t wait to see what 2014 has in store for you this year! The estate sales have officially just stopped in West MI too. I’ll have to find other ways to feed the addiction until spring time . Hugs! Love, love all of these. And I was not at all surprised to see that typewriter at the top of the page. It is just grand. Happy New Year! We must like the same things, because I LOVE every single thing in this post! 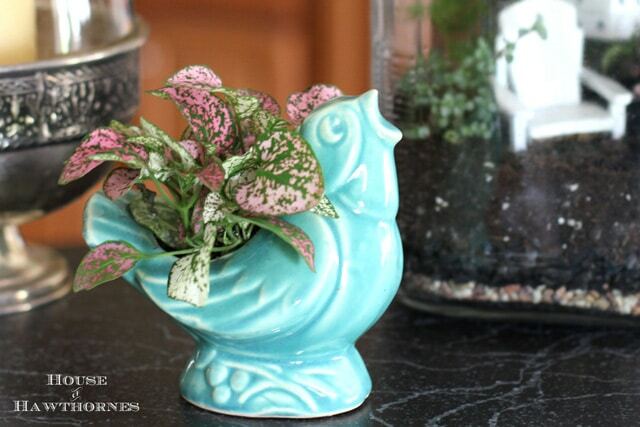 I adore that little bluebird planter, and that has got to be the cutest typewriter I have ever seen! I have never seen a green one, it is awesome. Happy New Year! I so love your style ~ I’m so glad that I found you my new friend! Merciful heavens, I’m salivating over every single one of these finds. That mixing bowl…I’ve never seen anything like it. And the typewriter has to go in a vintage find Hall of Fame somewhere. 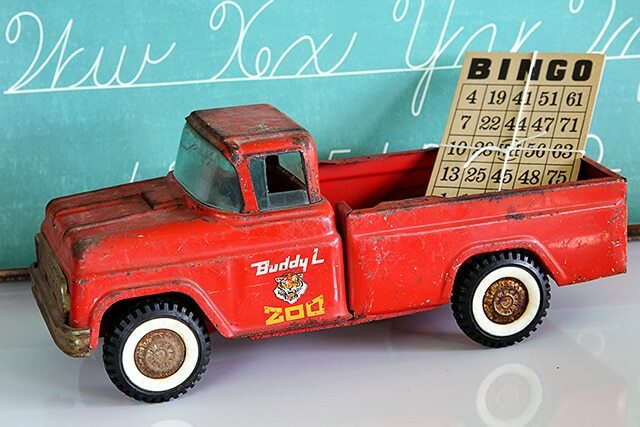 I was at an auction last week that had a lot of those Buddy L vintage cars…they were going for upwards of $100+! So if you paid less than $99, you got a deal! Oh yes….all great finds! Love, love, love that typewriter!! These finds make me smile, I love your Royal typewriter, but what really touched me is all of the McCoy you’ve collected. My grandmother collected this as well. Happy New Year Pam! It was so great meeting you this year at CLF! Looks like we’ve got similar taste — and we’ve both pried pencil sharpeners off of walls at estate sales! 🙂 I assume you got permission, too? Great finds! I especially love that typewriter! I would love to find a typewriter like that. A fantastic find! 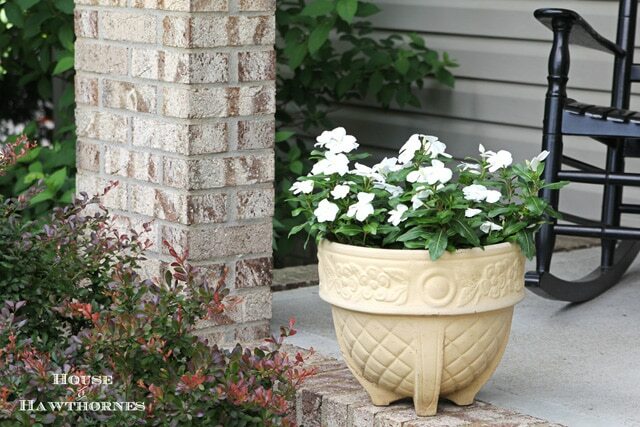 I really love that little blue bird planter too. I can’t wait until the Spring when our yard sales start up again. Until then, it’s off to the Thrift store I go. Happy 2014! LOVE, love, love all your thrifting finds, but if I had to pick my absolute fave, it would probably be your little red truck. SO cute! Looking forward to seeing what you can’t resist in 2014. 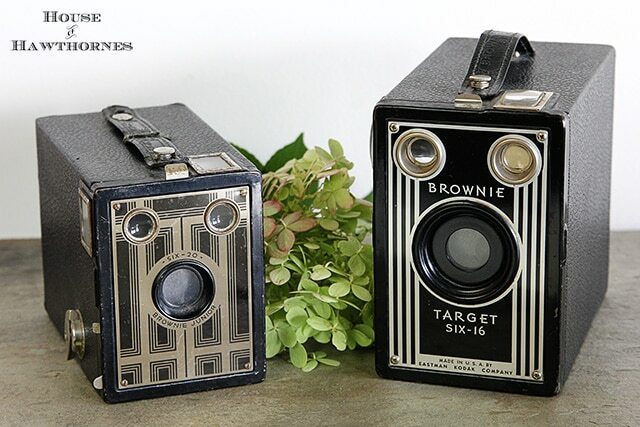 I can;t pass up a great old camera either! I have about 10 now and just love them! You sure found some fantastic things! That green typewriter is glorious! My favorite would be the green typewriter too, but I love it all. You are good at finding interesting items. You sure found some treasures, Pam. Love that typewriter!! Pam, thank yo uso much for visiting my blog and leaving a comment! I always love finding people who share the same passion as I do and it’s one of the main things that keeps me going- and made me want to videos. Your blog is AWESOME!! I’ve been bouncing around from page to page here this morning and know I’ll be spending (a lot) more time here today and in the future. Thank you for your beautiful blog, I’m happy to “meet” you!! !